An announcement in early 2013 saw Galt Toys being awarded the worldwide licence to manufacture and sell Ambi Toys. This company started life in 1969 and was owned by Brio for a short time before being being bought by the Italian company, Selegiochi, in 2009. Patrick Rylands was the company's chief designer for over 25 years and the company continues to focus on the principal vision that Rylands had for the brand. Ambi Toys are quite unmistakable. The bright, primary colours, solid and reliable build, and quirky designs appeal to infants and adults alike. The focus on quality is evident in each and every Ambi toy – and because the products have all been developed to maximize imaginative play, they provide great value for money too. 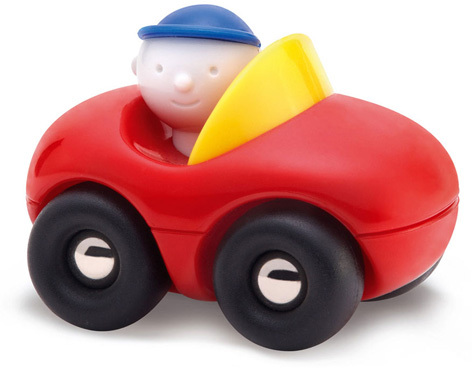 The Ambi baby toys ranges are an eclectic assortment of classics from the past. With timeless rattle keys, teething rings, carousels and bath toys, the collection may be small but it provides young children (from the ages of 3 months to 2 years) with some of the all-time classic toy themes that never fail to amuse and delight.